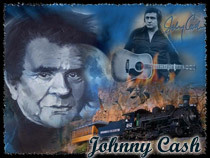 John R. Cash (26 February 1932 – 12 September 2003), born J. R. Cash and most famous as Johnny Cash, was a Grammy Award-winning American country singer-songwriter. Cash is widely considered to be one of the most influential American musicians of the 20th century. He was a poor sharecropper's son from Kingsland, Arkansas, who sang to himself while picking cotton in the fields -- then later sang to millions through recordings, concerts and his late-'60s TV variety show. Perhaps the most widely recognized voice in country music, Cash recorded more than 1,500 songs. His career spanned more than four decades with trademark hits like "A Boy Named Sue," "Folsom Prison Blues, "Ring of Fire" and "I Walk the Line." Rediscovering his Christian faith, after a spiritual epiphany in the Nickajack Cave in Tenn., he responded to an altar call in Evangel Temple, a small church in the Nashville area. Cash chose this church over many larger, celebrity churches in the Nashville area because he said that there he was treated like just another parishioner and not a celebrity.